The best way to enjoy the new Danny and the Champs album is to throw away the notebook, park the analysis and kick back with your hands clasped behind your head. BRILLIANT LIGHT hits the shelves on June 30th and immediately possesses a spring in its step to be the ‘soundtrack of the summer’. In fact, this record has an added effect of taking you back in time to when music had a more innocent appeal and concentrated airplay provided the opening to the masses. Sadly, those times are a distant memory meaning records like this have to scrap hard to be heard. Those who do cross its path though are in for a real treat. Danny and the Champions of the World has always been a band where you just want to chuck labels, compartments and the proverbial ‘little boxes’ away. The guys just make music that comes from instinct with the only boundaries coming from finite tangible resources. Heart, soul and ideas are infinite, thus joining the Champs bandwagon (or tour van) is a journey full with laughs, energy and a desire to just make music that folks will feel something for. The new album is perfectly in tune with how an outsider perceives the ideals to be: carefree, crafted and packed with positive guile. Now the first warning is that Danny has binned convention by tossing away the archetypal mean number of tracks and decided to go with a hefty number of 18 songs. However, don’t be put off by the 80-minute running time as this album can be enjoyed in a multiple of ways including just being a background to everyday tasks that can open up their arms to a little musical accompaniment. In fact the tip is not to think too deeply about this record, Danny has done the job for you and from the perception of seeing him live many times over the past few years, more than happy for you to just soak up the vibes. For a little bit of background information, the album is once again released on the regular home label of Loose Music, frequented by the usual Champs many who have served Danny well since he made the decision to channel his creative talents through this fluid collaboration. The lengthy track list is full of live stompers that will surely become gig staples in years to come and those penned from a more personal angle such as the pre-aired ‘Swift Street’. From a sound perspective, the golden mix of guitars, keys, steel and horns blow away any constraints of genre restrictions, while Danny’s vocals continue to coat each song with a touch of personal soul. One of the most liberating aspects of listening to BRILLIANT LIGHT is steering clear of track dissection and just taking the music at face value. 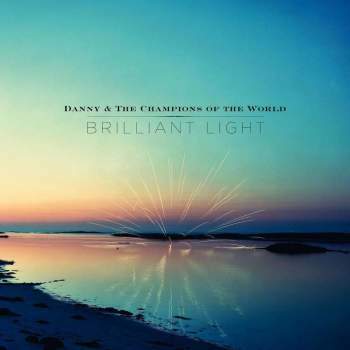 This approach may not always be the best way of grasping a record or artist, but in the case of Danny and the Champions of the World, it is increasingly becoming the de facto way of maximising the appeal. The term ‘soundtrack of the summer’ has a hazy nostalgic twist to it, stirring up the memory bank. This album has succeeded in locating a key to the past. While other music over the summer will challenge me and invite scrutiny, there is a ‘go to’ record in the corner ready to provide instant relaxation and relief. Danny Wilson is the architect of this record and it is an absolute gem.